Two of the biggest names in premium headphones— Bose and soon-to-be-Apple's Beats —are set to square off in court, with a new lawsuit filed on Friday by Bose alleging that Beats products infringe on its noise canceling patents. 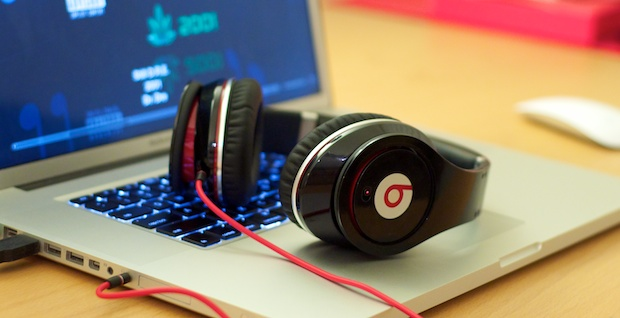 Bose Corporation filed the complaint against Beats Electronics, LLC and Beats Electronics International Limited in a Delaware court, asserting that Beats has infringed on Bose's "valuable patented technology for noise cancelling headphones." The lawsuit is joined by a complaint that has been filed with the International Trade Commission seeking an injunction. Specifically, Bose accuses the Beats "Studio" and "Studio Wireless," which are advertised to feature "Adaptive Noise Cancellation," of infringing on its patents. Bose asserts to the court that "Beats knows or is willfully blind to the fact that" its products are infringing on its patents. In the complaint, Bose states that the company pioneered the technology behind active noise reduction, which reduces unwanted noise by introducing a second sound source that interferes with it. Headphones featuring active noise reduction usually rely on a microphone to reduce background noise. '537: "Method and Apparatus for Minimizing Latency in Digital Signal Processing Systems"
'150: "Dynamically Configurable ANR Signal Processing Topology"
'151: "Dynamically Configurable ANR Filter Block Technology"
'888: "Digital High Frequency Phase Compensation"
If the lawsuit drags out, it could last until Beats officially becomes a part of Apple, which would make the lawsuit targeting Apple's bottom line. Bose is seeking damages in the suit of an unspecified amount.